WSU Team Mentoring Program students gather for a photo at Boeing in Everett, Wash.
EVERETT, Wash. – A recent visit to Boeing’s Airplane Integration Center ignited a flurry of ideas in Allyssa Hampton’s mind. 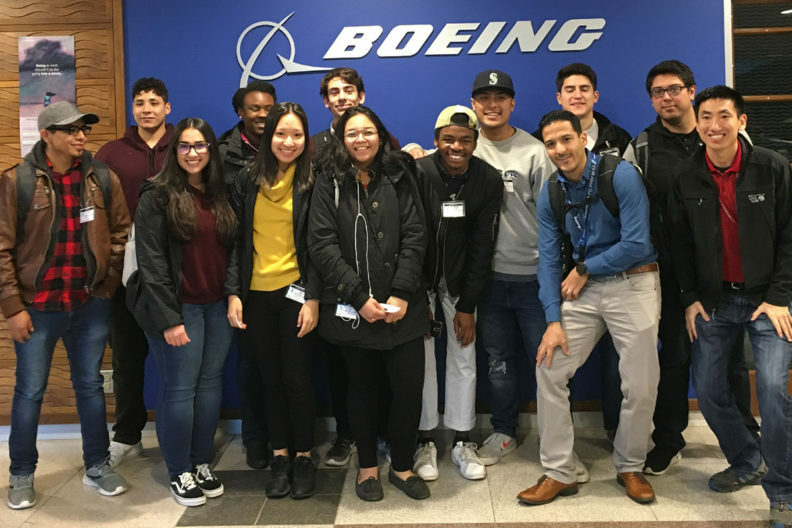 The Washington State University engineering student and nine others from WSU’s Team Mentoring Program (TMP) toured several Boeing facilities in Everett, Wash., last week. That kind of creative thinking is exactly what J. Manuel Acevedo, director of the Office of Multicultural Student Services, said the trip was designed to spark. TMP is a collaborative program led by WSU’s Division of Student Affairs and four academic colleges that aims to support students majoring in science, technology, engineering, mathematics (STEM) and pre-health disciplines. Boeing has been a major contributor to the program for the past 10 years. Tapping into miles Alaska Airlines donated to WSU for educational purposes, the TMP students and a program graduate assistant flew to Seattle and back at no cost to them to participate in the tour. The entire itinerary was created by TMP alumni and Boeing engineers Kye Terry, Corinna Cisneros and Victor Barona. In addition to the Airplane Integration Center, where the designs of planes come to life in the largest airline manufacturing facility in the world, the alumni took the students to the Safety Promotion Center. There they learned how past tragedies in the airline industry spurred new innovations making air and space flight safer. 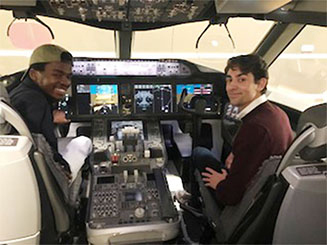 “We wanted to give the students a better understanding of what engineering jobs are like in the aerospace industry and give them an opportunity to network with professionals who can help prepare them for this competitive job market,” said Terry, a 2011 WSU graduate and design engineer for Boeing. Students get a view of what pilots see via a Boeing cockpit replica. Sophomore Jordan Getty said one of the most memorable parts of the trip for him was getting the chance to see the 787th Boeing model 787 being built. He was particularly impressed with how Boeing, through years of design changes, has drastically reduced the number of hours it takes to construct a plane. That efficiency now allows them to produce many more airplanes than previously thought possible. Following the Boeing tours, the students attended a networking dinner with TMP alumni living in the Seattle area. Acevedo said the students took full advantage of the opportunity to ask the recent graduates questions and were impressed with their rapid success. Hampton said majoring in STEM can be intimidating, and it is tempting to assume that all your class-mates are smarter than you or are extraordinary. She said hearing alumni talk about their experiences as WSU engineering students helped her realize that one does not need to be perfect to achieve success. In partnership with the Division of Student Affairs, TMP is coordinated by the Voiland College of Engineering and Architecture; College of Agricultural, Human, and Natural and Resource Sciences; College of Arts and Sciences; and College of Veterinary Medicine.